I was arguing with someone in an elevator. "You're supposed to know where we're going!" Someone said, in an exasperated voice. etc. etc. You get the idea. I have been endlessly frustrated by what genre SHARDS OF GLASS is, and as I'm moving forward on other writing projects, it's not getting any easier. With SHARDS, I said, "Oh, I won't worry about genre now; I'll know what it is when it's finished." Yes, about that. It's finished, and determining how to describe it in a query letter is more painful than the edits. At first, I was thinking chick lit, but chick lit doesn't generally involve heavy topics like, oh, assisted suicide. It's hard for me to call it literary fiction (which sounds pretentious for my surprisingly bubbly little novel). Nothing about suicide screams "commercial" to me. I have no idea what I'm doing here, people. I look at my theme and plot summary for THE GODDESS OF VENGEANCE WORE PINK GALOSHES, and again, I have no idea what genre this would be. I think of it as chick lit, but is anyone goes to accept chick lit with a strong horror element? At least this time, I know writing it is not going to clear up the mystery. What's the answer here? After some research, I'm going with "Women's fiction". Women's fiction is supposed to focus on the story of a woman or on women's issues (Interesting article on women's fiction vs. romance here). While I think the issues in my novels are universal (the complicated nature of suicide for the terminally ill, the role and hazards of vengeance in a society), I have strong female protagonists. Although my hunky male Marine friend loved the draft he read of SHARDS, somehow I expect more women will be drawn to these titles than men. So women's fiction it is. What genre(s) do you write? Every any moments of doubt about what genre, exactly, a story was trying to be? Welcome to the 101+ Follower Contest! Tell your friends. The winner has a choice between TWO fabulous prizes. I want to support the 2010 debut authors, so I'm giving away some of their books! That's All Unquiet Things by Anna Jarzab and Scones and Sensibility by Lindsay Eland. They're two very different YA books, but they both look intriguing. So there you have it. Your choice of two great debut novels or an adorable bag. That means for new followers, a max of 6 entries, and for old followers, a max of 7. Contest ends March 13th. If you don't mind, please tell me which prize you'd like in the comments, but the winner is free to change their mind! Shards of Glass has been resting before edits. I did get a wonderfully helpful critique back from my beta reader. It's so cool to see your writing through someone else's eyes and discover its strengths and weaknesses. For instance, she felt the satisfying end of the book came about a chapter and a half before my ending, and the rest was just a final tidy-up of loose ends. I still have to get into re-working that section, but it was a neat perspective to see and I like her ideas. (Speaking of which, does anyone have any interest in beta-reading SHARDS once I've done my next round of edits?). Shards is also hanging in there at PageToFame, with 41% of readers voting for it to continue to Round II (from what I've seen of PageToFame, that's actually a pretty solid upvote). 22 readers so far, so it's going to be a while before the Magical Algorithm determines if I go to round II or get booted. 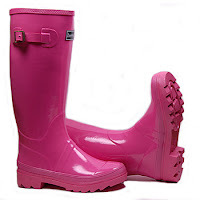 The Goddess of Vengeance Wore Pink Galoshes... 1,928 words. This is something I only recently started working on, and you can read my elevator pitch for it here. Outline for Goddess...1,679 words. Yes, this is new for me. When I read Plot & Structure by James Scott bell, one of his suggestions for the seat-of-your-pants type writers is to start outlining for the begining and then add to your outline as you go, combining planning and flexibility. I have a detailed outline for the first fourth or fifth of the novel, and I'm going to keep building it as I go. So... outlining is brilliant. Or at least, a serious time saver. So far, I can write 500 words of Goddess in under 1/2 hour, which is quite helpful for my morning routine. Pretty quiet on the reading side. I'm still working on Beautiful Creatures by Kami Garcia and Marget Stohl, and I finished Hush, Hush by Becca Fitzpatrick. I'm enjoying both, but I do wonder about the message that all these fated-romance books -- cummulatively, not blaming any one title -- have on teenagers' perspective on romance. That could be a post all of its own, though. Due to aforementioned Those Days, I haven't been around to many of your blogs as I'd like, but hopefully I'll get a bit of a chance to rectify that in the next few days. How are all your projects going this week? Read any good books? April wished the drive home would take longer. When Nick pulled into her driveway, it was hard to leave the warm car. On impulse she leaned over to hug him. The clutch jabbed her in the stomach, and Nick, obviously surprised by her lunge, pulled away. April hugged him awkwardly and then escaped back to her own seat, her cheeks suddenly flushed. “Bye,” she muttered, throwing the car door open. She slammed his door shut behind her and ran for the house. When had she become so incompetent? At everything? Summer at And This Time, Concentrate! 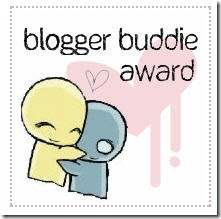 gave me the Blogger Buddy Award. This is like, the cutest thing. Thanks, Summer! The thing that made me happiest about this award was that Summer said I was one of her early supporters and helped her feel welcome in the blogging community. Aw! I really love our writing community, so that gave me a warm & fuzzy feeling (and not because my cat has fallen asleep on my feet again). So, in that spirit, I'd like to extend the blogger buddy award to some of the blogs I've just recently started following... I'm always glad to meet new blogging friends. I'm going to warn you now, today's post is outrageously fluffy, full of perfume and chocolate and chatter. So if you're looking for a serious writing post, please return tomorrow. If, on the other hand, you're in the mood for some fun blog awards and marshmallow factoids, you've come to the right place. You must name 5 fun-tastic things about yourself!!!! 1. My perfume is Philosophy Amazing Grace. With so many allergies in my fam, this one is a miracle that everyone enjoys sneeze-free -- it's light, clean and feminine. 2. I usually wear the same jewelry every day (I feel like I'm less apt to lose it this way): my wedding and engagement ring, a blue sapphire ring, Citizen Eco-Drive watch and pave diamond hoop earrings. 3. 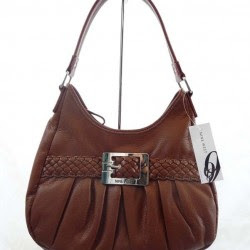 I tossed my motley collection of purses and now pretty much just rotate between brown Coach purse and black Coach purse. Now I don't forget my gum and sunglasses in a different purse all the time. 4. The daily uniform is jeans, a tee, and either boots, ballet flats or flip-flops. I worry I still dress like I'm in college. 5. My fave clothing stores are Express & American Eagle. Which may be part of why I still dress like I'm in college. For this one, everyone tagged has to tell ten things about themselves. You guys are going to be sick of top ten lists about me... but first! 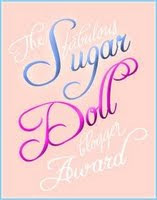 I'm awarding the Sugar Doll award to some of the sweetest bloggers around... the ones who make blogging such a wonderful community for all of us! Summer, of And This Time... Concentrate! 1. I did ballet for ten years as a kid and teen, and I still miss it. 3. I even choreographed a few dances. 4. My alcoholic beverage of choice is Long Island Iced Tea. 5. On my wedding day, I walked down the aisle to Sixpence Non the Richer's Kiss Me. 6. And I carried my dad's picture in a locket in my bouquet, but I walked by myself. No one else could take his place. 7. From age five to nine, I planned to marry Indiana Jones when I grew up. Not Harrison Ford; Indiana Jones. I accepted when I was nine that he did not exist and this marriage was not going to happen, but I was very bitter about it. 8. A day does not go by without me eating chocolate. 9. I have a little girl-crush on Kristen Bell, and I think she'd be perfect for April in the film version of SHARDS. I was seriously addicted to Veronica Mars when that show was on... the snappy dialogue, the clever plot arches, the gorgeous bad-boy male leads. 10. I do not like umbrellas. They're scary in anyone else's hands and awkward in mine. Ok, I am growing more intrigued with this site all the time. PageToFame is like an ongoing writing contest. Basically, you submit a 1-2 sentence synopsis and your first page. Readers rate these first pages on a scale from 1-5 (I've been rating quite a bit, and looking at all these first pages -- like an agent would -- is educational in its own right). There are four rounds. If enough people like your first page, you submit your first chapter, then the first 50 pages, then the entire book. When your story is elevated in each round, it's reviewed by a literary agent for its merit. I have a lot of questions about how this site is going to work out, and about the role of literary agents. But I do think the idea of using reader responses on the website to determine the marketability of a work is interesting (although I wonder how self-selecting the reader database is, as well). Despite my doubts, I'm intrigued. I like looking at other's first pages, and I'm curious how my own will do. Yes, yes. I have the first page of Shards up there. The site is still in beta mode, and it costs $5 to enter the contest. But, dear readers, I have a coupon code to share with you. Use coupon code mediabistro01 to receive a FREE entry. I've been running into a new problem while working on the rough draft of Bodie's Men lately. I've tried doing some research on it, but everything I've run across so far talks about the positives of writing fiction about subjects you know well. What about the hazards of writing about a subject you know well? Bodie's Men is (supposed to be a novel) about a girl who graduates college and decides, on a whim, to join the Marine Corps as an officer, in part to horrify her upper-crust parents. With my background as a Marine officer and Iraq vet myself, I know quite a bit about the Marine Corps. Too much, actually; it keeps tripping me up during my writing. 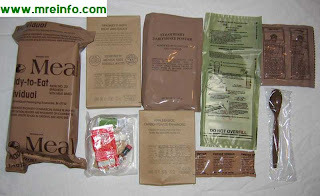 “You keep telling them that.” I stuck my brown plastic spoon into my MRE pouch. I was eating Chicken Breast With Salsa, which was only moderately disgusting, especially since we were on our five hours of rest for the night, less watch, and I’d had time to heat it for once. I'd like to submerge the reader in Marineland, but how many details are distracting? What makes sense without explanation? How do I stop explaining crap that people do not need to know? The spoons that come in our MRE (Meal-Ready-to-Eat) packages are brown. It's the only utensil in there, and when out in the field, most of us tuck our spoons into one of the loops in front of our flak jackets. It's not entirely cleanly, but convenient. But you don't need to know that, do you? Is it interesting? Is it a lot of extraneous crap about a spoon? It certainly can't all be dumped into one paragraph, but does putting it as little details even work, or does it distract the reader from the story? Everything is an internal debate like that, so far. I feel like my paragraphs are too long, too full of explanation between action & dialogue. There are all these little things, techniques, practices, phrases, titles, that don't make sense to any newbie on day one in the military. I want to be realistic without leaving the reader irritated or confused. I don't know whether I should just throw it all down, with whatever explanation or lack thereof comes naturally. Then I can beg people to read it and tell me what is unnecessary and what needs clarification. I know this is a technique problem, not actually an issue with knowing too much (although the latter sounds much more flattering ;)). I need to learn how to separate out what's truly relevant and vital for the reader, and what's unnecessary explanation. Right now, the challenge is irritating me immensely. Something tells me that Bodie's Men is going to be its own unique challenge, and an excellent learning experience... which is great. Really. Anyone else ever struggle with how much detail to put in, to avoid either confusing or irritating your reader? Can you know too much about your fictional world? Today's going to be a short roundup, as it's been a long week. I just finished a big presentation at work, which went swimmingly, but the build-up was crazy. But I do want to hit a few highlights! Win the entire Wake series over at Shannon's blog, Ramblings of a Wannabe Scribe. go here to enter! Here's an intriguing article on what it takes to become a writer these days, and how unlikely it is. Depressing? Noooo... It's actually upbeat in its artistic sentiment, at least. I'm not sure how to feel about Page To Fame from weBooks. Here's how it works: you can review and rate other writer's summaries and ealy pages (which has to be educational), or you can for $5 submit your own. There's a series of rounds; if your pages survive the first round of fellow readers, they are looked at by agents for a second round with more book requested, etc etc. Theoretically, these agents might want to buy your book, but somehow I feel skeptical about that part of it. It's the educational aspect I'm intrigued by. Anyone want to sign up for Page to Fame with me and play literary agent? If you live in the D.C. metro area, which I think is unlikely for most of my readers, but hey... the Writer's Center in Bethesda, MD is doing Agent Idol on April 18th. You provide your query and first three pages, and the agents judge your work. You can even win neat prizes, like free workshops. I've never done anything with The Writer's Center before, especially since it's a lengthy drive through D.C., but I think it sounds like an incredible resource I can't wait to check out! It's that time of week... already. Is it me, or are the days just flapping their taunting little wings past us? Shards of Glass.... 82,226 words. It's hard to tell what my actual word count was, since I was deleting some scenes and re-writing as well as adding in a new scene or too. But yeah, I think Shards is done. Again. I'm letting it rest before I start red-penning it to fix my POV switches and "kill my darlings", as they say. Even though I need to finish this process before I submit Shards to agent, I drafted my query letter so that I can work that into perfection by the time my novel is ready to ship, if requested. I did some work on Bodie's Men... 203 words. What? My focus was on Shards. I'm struggling with Bodie's Men, too, because I know too much about what I'm trying to write, which is as challenging in its own way as knowing too little. Yeah. That's a blog post of its own. And I got a rejection back from Hunger Mountain for my SS, "Bookworm". But it doesn't hurt my feelings. Hmph. I loved Lady Vernon and Her Daughter by the Rubino mother-daughter team. It's an adaptation of Austen's epistolary piece, Lady Susan. The tone was perfect, the characters sympathetic, the plot believable. If you're an Austen fan, I think this book is a safe bet. P.S. I think I like it better than the original. Sorry, Jane. And I read The Lightning Thief, the first in the Percy Jackson series by Rick Riordan. I enjoyed this. It's not quite my style, perhaps because I don't read many MG type books anymore, but I thought it was definitely well-written and entertaining MG stuff. So... how'd your week go? I love to cook and bake. If I find myself with a few free hours with no other pressing concerns (ha) I'm heading one of two places: the bathtub with a good book, or the kitchen to whip up a batch of cookies, muffins or cakes. Now, the product of this effort is always short-lived. Cookies, unlike Kiefer Sutherland, generally don't survive 24 hours. Dinner's even worse -- my lovely mushroom risotto is gone in less time than it takes on the stovetop. But (unlike my perspective on the dishes) cooking and baking never feels like a waste of time to me. Every time I make something, it becomes easier and more fool-proof. I can make pizza dough, pancakes and minestrone soup without consulting a recipe. I always need a recipe for muffins, but I'm sufficiently practiced that I can get ingredients together, mix it all and get the batter into muffin tins before the oven is done pre-heating. It's all easier and faster now than it used to be. For me, it's easier to feel this way about cooking and baking than writing, sometimes. When I pour my time and energy into a project, I want a happy outcome (Incidentally, this is also why I'm terrified to touch the sewing machine). Writing isn't like that, though. Sometimes I tackle a project with a great idea, and then find out I don't quite have the technique (yet) to have it all play out the way I expect. Sometimes I finish something and it's just not ready, or technically fine but really, nothing special. All of the above makes me want to throw my laptop through the window, but unfortunately MacBooks are not very hardy, so I have to resist the temptation. And, of course, remember that the writing is never wasted. Every time we put our pen to paper or our fingers to the keyboard, we learn a little more about the art... even if it doesn't feel that way in the moment. And if that doesn't cheer you up? Well, there's always chocolate. What makes you feel down about writing, and what picks you back up? 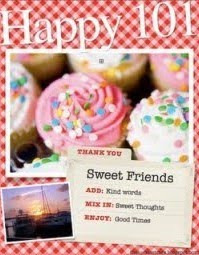 And... what's your favorite baked good? May this commercialized and artificial day none the less be full of true warmth, affection and love for you, dear readers. Like the child born into privilege. That mischievous sheen in your eyes. as the sky blushes with that first glow. Like Noah’s first breath after the flood. And you and I talking all night. The spoiled children of this earth. I'm not sure if this is purely a Marine-ism or something that normal people say, as Marines have their own language. Marines say "On your own program, aren't you?" when someone is doing their own thing, instead of pulling for the team and following orders. In fact, it's also an acronym: OFP. Own. Frickin'. Program. With SHARDS, my characters have been on their OFP. The worst of it is the relationship between April and Connor. They break up early in the book, even though Connor and April are the fated lover types. April needs Connor's sanity, and Connor needs April's liveliness. At the end of the book, they were supposed to re-unite with a slightly ambiguous ending, agreeing to give their love a chance and rebuild their trust in each other. But. They wouldn't stay broken up. It was only a matter of chapters before they admitted they missed each other. Then Connor started trying to help April with her situation. She confessed that she loved him, chose him. They would not stay apart, like they were supposed to. 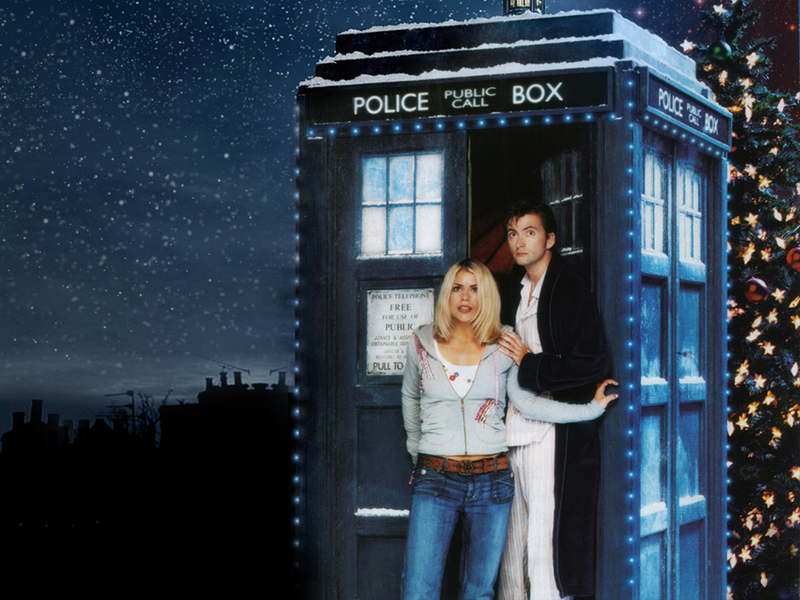 So they have a happy ending, because I couldn't get away with writing anything else. I find it best to accept my characters' stubborn natures and follow the deviations in my story arc, because anything else would ring false to me. But, man. How do characters get so out of control? Does this happen to you? Do you try to steer your characters back down the path, or give up and let them run, skip and amble ahead of you to some unknown destination? I usually do excerpts on Mondays, but my schedule is a bit off this week. Generally these excerpts are from SHARDS - something all around a little different today, though. I'm doing an excerpt from my fantasy novel, HER OWN BEAST (that title is so, so tentative). This was my '08 NaNo, far from complete at 58k, and I've put it aside for a long time because, well, I thought it was terrible. But needing a break from SHARDS, I picked it up this past weekend. And I love it. I think this story deserves an ending (some more middle, too, and then an ending). Dawn had just broken, a red and golden glow through the trees on the horizon, but Lady Alyana didn’t look up from the ground as she crossed the keep to the gray cut-stone chapel. The morning was cold, and she felt her hands already growing numb within the folds of the heavy shawl draped across her head and shoulders. Her legs were stiff, but they carried her up the steps of the chapel and into the main chamber. The shutters were open despite the chill, and the chamber was no warmer than the late fall day outside. Alyana didn’t pick her eyes up from the stone floor here, either; she knew her way to the chapel without looking up, and she knew the chamber without needing to see it, and she knew who was here with her. “Yes, milady,” Alyana said softly. “Did you dream last night?” Lelene asked. Alyana knew that Shema, standing behind her, was also cold and stiff and filled with dread. Shema was supposed to wake Alyana every hour, and whenever she stirred with her dreams. Last night Shema had fallen into a deep exhausted sleep herself, and Alyana had woken on her own, at the end of her dreaming. Alyana would never understand why her aunt asked for details of something she considered an abomination, something that would only disturb her. But her voice dropped even lower in her shame, barely a whisper scraping across the cold wind that blew through the chamber. “I dreamed I was running, out in the open of winter.” Alyana said. Last night she had not been cold, had not felt sore and arthritic as she did now at only fifteen; she had bounded over the snow, her paws sure of their grip even across the ice on the lakes. She had come over a drift in the snow and found a rabbit, which froze, trying to blend in with the winter landscape its white fur matched. Alyana had woken up with the raw taste of blood in her mouth, startled out of her night world into the room in the keep, candles burning everywhere to keep her from falling too deeply into sleep. Shema slept across her feet at the bottom of the bed, one arm thrown across her face to block out the light. Alyana was torn between relief at escaping worse punishment, and dread at beginning the daily one. She walked slowly to the front of the chapel and stopped in front of the carved wooden altar. It was plainly decorated, with more burning candles and with bundles of rushes piled at either side. Shema came up to her side, carrying the leather sack of pebbles; she took a handful out and sprinkled them in a small circle in front of Alyana. Then she bent to pick up Alyana’s heavy skirt from the floor, bowing low to the ground to maintain Alyana’s privacy, so her aunt and priest couldn’t glimpse her ankles above the fur clogs or the tip of her undershift. As she lifted the skirt, Alyana crouched down, her weight on her heels as her knees fell against the pebbles, and then sat up into a high kneel, her back straight, all her weight on her knees. The old bruises ached immediately, the black and blue and yellow that had formed across her knees and shins. Alyana knew the pain would only get worse from here, so she pressed her hands together in front of her face, tilted her head down, and tried to recall the feelings of last night. The feeling of being a wolf, and being free. SHARDS OF GLASS... 79,859. I added 3,271 words this week, and typed THE END. Of course, it isn't really the end. I have a list of scenes to add in, so I expect to finish those over the next two weeks and weigh the final novel in around 85,000 words. Certainly a much more svelte document than my first draft! I also finished my first beta reading for another writer, which was both fun and challenging! I love her comments on my novel so far, so I really wanted to do justice to her work. Editing is hard work, but it's even harder to edit well for another writer and ensure you communicate your thoughts to them in a way both helpful and considerate. More on beta reading to come -- I think it deserves its own post! Also, this week I discovered the wonders a four-hour flight can contribute to your planning. I emerged from my Monday flight from Chicago to San Diego with five pages of outlining and character sketches for two new novels I want to begin! Not bad for being trapped in the middle seat. 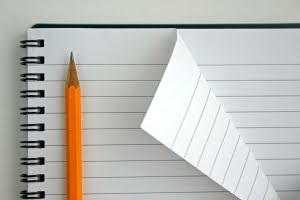 ;) Oh, Shards, you need to be finished... much as I love you, I am eager to write something new! Flying is also helpful for my reading (between that, the dining out and the adorable VW Beatle I'm renting right now, you'd think I would be psyched about all this travel for work, but not so much. Especially as due to weather, I am currently stranded in San Diego). I'm now up to 20 books so far in 2010 for the 100+ Book Challenge... amazing! I'm reading a lot of books I wouldn't otherwise have due to this challenge, and loving every minute of it. I did a short review on both The Dark Divine and Boys, Girls and Other Hazardous Materials in my Saturday book reviews post. So, I'm going to talk about the other two books a bit today. First of all, The Hunger Games. Wow. I know a lot of you told me to expect something awesome, and you were right. I loved this book. Suzanne Collins' world-building is incredible, and she makes the barbaric idea of The Hunger Games (where two teenagers, a boy and a girl, from each of twelve districts are gathered to fight to the death in the wild) completely credible. And terrifying. I liked the characterization, especially the way Katniss and Peeta, the two selected from their district, stay true to themselves in their own ways throughout the book, without ever being soft. Secondary characters, like their mentor and theirs stylist, are also beautifully drawn. And both plot and story zip along at the perfectly quick pace that made this book impossible for me to put down (luckily, I was on an airplane, so I didn't). In short, two things: 1) I want to be Suzanne Collins when I grow up, and 2) I need the sequel, like today. Book 3 comes out in August, and I might pre-order it (for that matter, if you guys don't mind me reading it first, I'd love to then do a blog give-away for it, since I know how many of you loved the other books). See Jane Write: A Girl's Guide to Writing Chick Lit was a fun little book on writing. It was written as a collaboration between a successful chick lit author and an editor for a chick lit imprint. I felt like this book was marketed towards the woman without much past writing experience, not for someone who is already semi-knowledgable about the art and industry. It's a primer -- the pair discuss developing ideas, POV, plot, character development, finding an agent, etc. I used their character sketch suggestions to develop the character of Lauren Reed for a story tentatively titled THE GODESS OF VENGENCE WORE PINK GALOSHES, and gained some good info about her. Overall, I felt this was a cute book that didn't have a lot of new info for me, so I wouldn't add it to my writing bookshelf. However, I'd definitely buy it for a friend who was interested in writing her own chick lit but had only dabbled in writing a little. On a completely separate note, I'm up to 85 followers. Does it ever get old to see that number go up? I'm excited every time (in fact, MJ could probably tell you the number too, since I talk about the blog and the writing community as a whole quite a bit). I love it when new blogging friends find my blog. And I have an idea for a 100 Follower Giveaway that I think you're all really going to like, so I'm excited about that, too. In order to be prepared, I ordered something recently for when the big day arrives! I know I have one of the few writing blogs with evident advertising -- like the Swagbucks search engine in the sidebar and the Amazon links in the posts to the books I check out. Eventually, though, I'm hoping these elements will fund more give-aways on my blog... I plan to put all revenue back into fun stuff for my readership. ;) If you click on one of the book links to Amazon, and then buy something (it doesn't have to be the book I showcased), This Is Not My Day Job gets 4-6% of the item cost. If you join Swagbucks, which is a search engine with advertising, you can earn points towards gift card, and I'll receive a percentage of your points, too (I haven't actually cashed a GC in yet, but this seems like a reputable site, and the points are slowly accruing for Amazon GCs). So I hope the adverts aren't distracting or off-putting, especially knowing my reasoning! 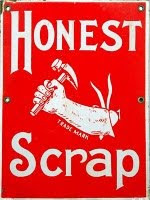 Much thanks to Christine and Lynsdey for the Honest Scrap Blog Award! 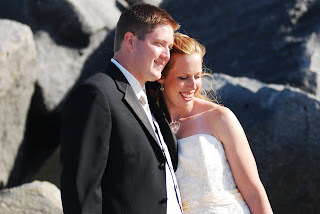 Be sure to check out both Christine's blog and Lyndsey's, Dangerous With a Pen. These are both newer blogs that I love! I have to list ten honest things about myself! 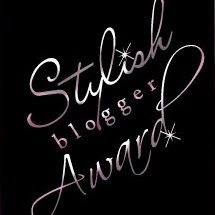 But first, of course, I'm passing this award on to some bloggers that I want to know ten new things about! Summer at And This Time, Concentrate! 1. I cry at SPCA commercials every.single.time. 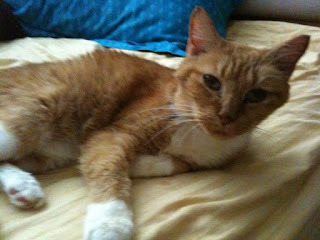 I also donate to and volunteer for the SPCA, and I get a little intense about treatment of animals. 2. I have broken nine bones in my feet (unpleasant and unrecommended). 3. I didn't know MJ's last name the first time I stayed at his apartment, and I checked it on the mailbox on the way out the next morning. It's the only time I've ever done something like that... obviously it worked out, though! 5. I am secretly proud of being a natural blond as an adult, even though I realize this is positively ridiculous - I have no control over my hair color. 6. I've always loved flying and started earning my private pilot's license in high school, but ran out of money and time when my dad got sick. Someday, I look forward to picking it back up again! 7. My mother almost named me Cassiopia instead of Guinevere. 8. I hated pink as a kid, but it became my favorite color once I joined the Marine Corps -- just a little act of rebellion against the olive-drab and brown sameness of everything. I even wear rose-tinted sunglasses. 9. I've been to all seven continents. 10. My undergrad degree is in History, but I also minored in Law and Physics. It goes without saying that this makes me, well, happy! Thanks so much, Roni! Roni writes the awesome blog Fiction Groupie. If you're not a follower yet, you have to visit. We adopted her from a rescue in 2005, and since then she's made me laugh/swoon over her cuteness on a daily basis. 2. Writing. Not always in the moment, but the product always makes me happy! 3. Reading a good book -- whether it be non-fiction like Mary Roach's Stiff: The Curious Lives of Human Cadavers to wonderful fiction like John Connolly's The Book of Lost Things. Also, reading said good book in the tub with a Lush bath bomb greatly enhances the happiness factor. 4. My husband, MJ. Making my world a sweeter place since 2004. 5. Sports. The doing kind, not spectating. I love to run, play soccer, snowboard, mountain bike, kayak and white-water raft. Moving my body makes me feel alive. 6. My friends. We live all over the country (and all over the world) but they still find a way to make me smile. 7. Baking. Especially if it involves chocolate. 8. Learning. I gripe about school a lot, of course, but I enjoy my Master's program in Finance. And I plan to take classes for something or another for the rest of my life -- I already have some community college courses picked out just for fun when I finish my M.S. (German, painting and photography). I embrace the title of "Geek". 9. My house. I grew up in a small single-story house, and always dreamed of a big house with lots of space. We bought a two-story Colonial with a nicely finished basement, 4 bedrooms, 3.5 baths... we are slowly re-finishing and decorating it to suit our tastes, but every time I pull into the driveway, I think, I can't believe something so nice is really mine! If everything works out job-wise and whatnot, I would love to raise our kids in the house and retire in it -- I just adore our home. I never knew I could feel so strongly affectionate about a "thing". 10. Grocery shopping. I know it's weird, but I love grocery shopping. MJ and I go together and have a good time chatting as we try to follow our list. Now, to pass the Happy 101 award on! This week I added two 2010 debut novels to my reading roster. I read The Dark Divine by Bree Despain, and Boys, Girls and Other Hazardous Materials , by Rosalind Wiseman. First off, how beautiful is the cover art for The Dark Divine ? It seems barely appropriate for a book about a pastor's daughter, but then, Grace Divine isn't your average preacher's daughter. Here's the Amazon synopsis: Grace Divine, daughter of the local pastor, always knew something terrible happened the night Daniel Kalbi disappeared--the night she found her brother Jude collapsed on the porch, covered in his own blood--but she has no idea what a truly monstrous secret that night held. I enjoyed this book quite a bit. I thought the world of Grace Divine really came alive, with realistic characterization. Her parents annoyed me immensely, but they also felt true-to-life. I empathized with Daniel, and felt Grace's urgent need to help him. Some of the plot elements of the mystery were a little predictable regarding the ending, but the plot advanced so quickly I couldn't mind. The ending was beautiful and unsettling, and left me looking forward to a sequel (which is rare for me, I usually dislike stories that are obviously preparing for a sequel). I'd like to know more about what happens to Grace, her brother Jude, and her friend Daniel. Looking for a new beginning after a terrible mean girl past, Charlie Healey realizes there’s no escaping high school drama. This was a really interesting story. There was one thing that really bothered me and made it hard to read on, although this largely a "personal problem" - I was so bothered by Charlie's reaction to her friend Sydney's distress. Sydney, is sexually harassed by some of the guys, and when Sydney publically humiliates him in return, Charlie tells her friend that she's gone too far and become like him. Yeah. Having been sexually harassed in HS, I think Sydney was in the right, but it also made Charlie feel fake to me. That's not how friends act in my world. Maybe it's just that I didn't really like Charlie. Which is strange, because the secondary characters in this book were great. I loved the secondary characters of Charlie's friends, Sydney and Nidhi. It was wonderful to read about girls being genuine friends as opposed to frenemies, even though Charlie certainly had some frenemies in her past. I also really liked the unique depiction of high school. There are some untrustworthy adults and some very wise ones in this novel; the bulk of educators seem helpful and genuinely caring. While there are some unsavory elements to the school, overall, it seems like a pretty decent place. I liked that this high school wasn't the stuff of nightmares one sometimes reads about in YA novels. And I was thrilled to see a realistic depiction of sexual harassment in HS. It's never named as such in the book, but without a doubt in my mind, a bunch of guys hassling a girl because she turned one of them down is classic sexual harassment (it's not just for the workplace anymore). I think it's realistic, anyway, because it mirrors my experience -- little torments that add up to misery, and adults that deny what's happening (in the book, Sydney is told that she should take the unkind attention as a compliment; for me, I was told, "Don't you think you brought this on yourself, by dating around the way you have?"). While it's not the focus of the book, I liked that this was addressed. Sometimes this book felt a little issue heavy and on-message to me (not surprising, perhaps, given Wiseman's background) but it was overall a good story. It had a very satisfying ending; happy, but not overpoweringly so. There's a note of conflict in the ending, but wrongs have been righted and love has been satisfied. What can I say? I love a happy ending. Not nearly as exciting a title as Seven Years In Tibet, eh? The following year was filled with challenge but also tension, and Koontz was more highly motivated than ever to build a career as a writer. He wrote nights and weekends, which he continued to do after leaving the poverty program and going to work as an English teacher in a suburban school district outside Harrisburg. After a year and a half in that position, his wife, Gerda, made him an offer he couldn't refuse: "I'll support you for five years," she said, "and if you can't make it as a writer in that time, you'll never make it." By the end of those five years, Gerda had quit her job to run the business end of her husband's writing career. Mm, say what? Koontz took five motivated years and developed a successful career as a writer. This struck me because, as you may remember if you've been following my blog, my goal is to make it in five years. Despite struggling with a day job simultaneously, this really reminded me of what can be accomplished -- especially given the coincidence of our similar time frames. Of course, MJ also offers sometimes to let me "retire" before 30 and take a few years off to just try and make it as a writer. It's hard for me to imagine giving up my career and jumping into writing before I've made it... but in a few years, it might be an option (right now, I'm under obligations to work). Wouldn't that be crazy? I've been thinking about how it could work -- I could do the Marines as a reservist (the one weekend a month/two weeks a year bit). I was just offered a part-time position tutoring for the finance classes at the university where I'm working on my Master's. I could still bring in a little money without major time investments. But that's a debate for another day! Right now, this option seems too far away to even consider. So I'll keep getting up at 6am to write before work, and trying to make it -- with a day job. Honestly, I think it would be hard to leave the security of my day job, too. There's a lot to consider. Are you a full-time writer or a dayjobber? Have you ever thought about how you could make it work to go full-time? Would you even want to? I just made my word counts for SHARDS this week, but I'm happy. I'm on the end stretch now -- no more wondering what has to happen next! SHARDS OF GLASS... 76.588 words. That's 2,683 words further along. That's it for the writing side this week. School's back in session, and work is cuh-razy. But getting up early (Earlier, I should say) to write each morning is working for me! We all know what the tortoise is about. Besides being adorably cute. On the reading side... thanks to crazy snow this weekend that altered my plans, I did a lot of reading! I'm up to 16 books so far in 2010 for the 100+ Book Challenge (links in the bar at the bottom of the page). I loved Hotel on the Corner of Bitter and Sweet by Jamie Ford. It's about a Chinese boy and a Japanese girl "scholarshipping" to a well-off white school from their ethnic neighborhood in Seattle during World War II, and what happens to young love when the Japanese-Americans are interned. I enjoyed the history in this book, the beautiful writing, and the true-to-life characters. It's just truly a wonderful and satisfying novel. I also finished Chasing Brooklyn by Lisa Schroeder. It's a verse YA novel, which was a little different for me. She does much with her characters in such a short amount of text; they're nicely developed. Enough so that her end made me misty-eyed, because I'd certainly come to care about them too. I'm not sure I'd read another Lisa Schroeder book, though, in the same style (such as I Heart You, You Haunt Me ) becausthe verse style was not my favorite. Switch by Carol Snow was a quick YA read that I enjoyed. And I also read A Clockwork Orange by Anthony Burgess, which has been on my to-do list for ages. This is the new, or British, version, which has Burgess' seventeenth chapter (which was edited out of the American version, for its optimistic tone suggesting that youth outgrow the violence throughout the earlier chapters). I definitely recommend getting this version! Clearly, I'm a writer, not a photographer. But the above stack of notebooks is the end result of my journaling career. I kept a journal from Christmas, 2000 to shortly after I graduated college in spring of 2005. Then I stopped. There are a lot of things I wish I'd journaled. I traveled extensively in high school, and I wish I had a more detailed record of scrambling up the cut stones of a pyramid (which isn't legal in Egypt, by the way), eating pierogi with a former member of the Polish resistance during WW2, and swimming with dolphins in the Bahamas, but I wasn't journaling then. 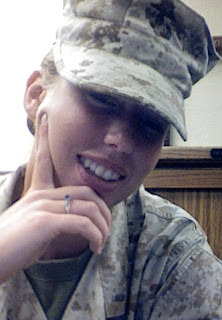 Since graduating college, I wish I managed to keep a journal about being a young platoon commander in the Marine Corps, marrying my wonderful MJ, and serving in Iraq. Somewhere along the line, though, I became too busy with other priorities to keep a record of what was happening! But I've also read the journaling is highly optional for writers. The strong memories, after all, the ones that can truly inspire your writing, will cling to you anyway. The dull moments can fade away and what you really NEED to write about will remain. I'm not sure I believe that, but I have to admit, I use my journals for nostalgia purposes. Their primary purpose in my writing is to connect me to emotions, not moments -- I can flip open one of my novels and relive all the highs and lows of being seventeen, nineteen, twenty. I don't go there for details or inspiration. How about you? Do you keep a journal, and if so, how does it fit into the rest of your writing life?